The Adopt-a-Bike program was organized by the Lake Region Resource Conservation and Development Council in 2004. 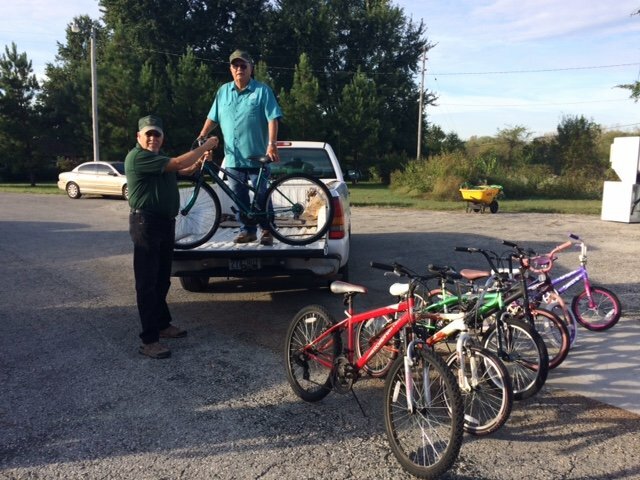 Since that time, through partner work with Lake Region Solid Waste Authority and Ellsworth Correctional Facility, the Adopt-a-Bike program has donated 2,500 bikes to children and adults throughout Anderson, Coffey, Franklin, Linn, Miami, and Osage counties. Broken and Unwanted bicycles are collected at drop off sites in participating Anderson, Coffey, Franklin, and Linn counties. Since the beginning of the program over 7,000 bikes have been collected. The bicycles are then transported to Ellsworth Correctional Facility where salvageable parts are stripped from the donated bikes and assembled into sturdy, functional bikes available to be adopted out into the community. The participating drop off locations for unwanted bicycles are located at the landfills and transfer stations in the following counties: Anderson, Coffey, Linn, and Franklin. The Adopt-a-Bike’s service area includes all of Anderson, Coffey, Linn, Franklin, Miami, and Osage counties.